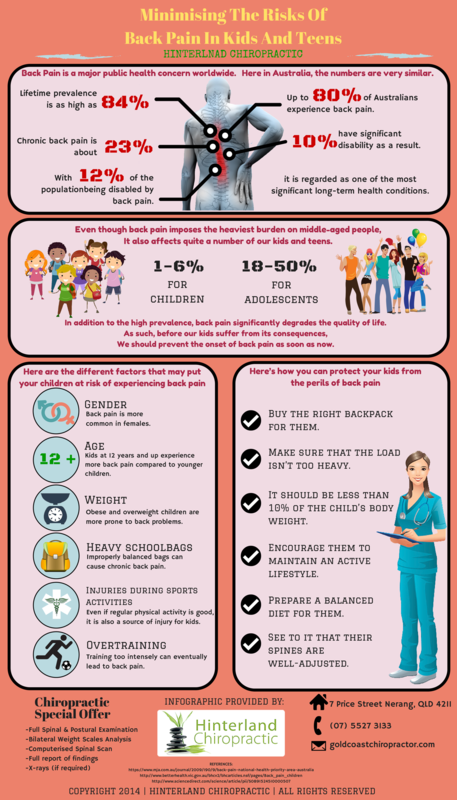 Back pain is not just a health problem experienced by adults. A lot of kids in Australia are actually at risk of developing chronic back pain as they grow up. For this reason, health care experts are encouraging Australian parents and guardians to be more aware about the specific factors that affect children’s spinal and overall wellness so as to prevent the problem and its consequences effectively. Here are just some of the things that you can do so as to minimise your children’s risk of developing back pain problems. Also, a lot of parents around the world today are turning to chiropractic for the health and well-being of their kids. It has been established by research that quality chiropractic care provides immediate and long-term health benefits even for kids as well as toddlers. All in all, you and your entire family can enjoy the advantages of the chiropractic lifestyle. For more tips on maintaining the optimal wellness of your family, consult your gentle Gold Coast chiropractor here at Hinterland Chiropractic. We can provide you with the best lifetime health care which is completely safe and all-natural. We have been helping families on the Gold Coast and other nearby areas achieve better health for over 20 years now. Call us today on (07) 5527 3133 or simply book your appointment online!